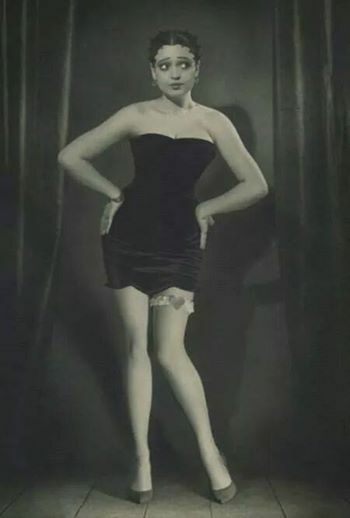 The Girl They Call Es: The Original Betty Boop. We all have a classic and iconic symbols and people we adore and seem to never get over. For many girls whose favorites are based on beauty we feel that we may never posess, one of those iconic characters is Betty Boop. The pixie haircut, big eyes, tiny waist, and amazing hips in the ulimate black dress-who wouldn't want to be her! But we just knew her as a cartoon in comics that eventually ended up on lunchboxes, notebooks and countless other merchandise. But did we really know who Betty Boop was? Was she even real? Well people, she was! And her story is more compelling than you would think. Ms. ESTHER JONES, known by her stage name, “Baby Esther,” was an ” African-American singer and entertainer of the late 1920s. She performed regularly at the (The Cotton Club) in Harlem. Ms. Jones’ singing style went on to become the inspiration for (( Max Fleischer )) cartoon character’s Voice and SINGING style of BETTY BOOP, was YES a Black Woman. Esther Jones who’s stage name was “Baby Esther” was a popular entertainer at Harlem’s Cotton Club in the late 1920s. Baby Esther interpolated words such as ‘Boo-Boo-Boo’ & ‘Doo-Doo-Doo’ in songs at a cabaret. Helen Kane SAW Baby’s act in 1928 and (stole) Used it in her hit song I Wanna Be Loved By You. An early test sound film was also discovered, which featured Baby Esther performing in this style, disproving Kane’s claims. Baby Esther’s manager also testified that Helen Kane had saw Baby Esther’s cabaret act in 1928. Supreme Court Judge Edward J. McGoldrick ruled: “The plaintiff has failed to sustain either cause of action by proof of sufficient probative force”. In his opinion, the “baby” technique of singing did not originate with Kane. Esther’s manager also testified that , Helen Kane & her manager , saw Baby’s act somewhere between 1928-1929. Scholar Robert G.O’ Meally said, Betty Boop The WHITE CARTOON herself had, as it were, a BLACK grandmother in her backround. Baby Esther was presumed dead by 1934, just when the lawsuit had ended. Okay, okay, maybe this story was super intriguing to me cause we have the same first name and I personally think all Esther's are super special (at lease all the ones I met and know of). Now, I won't get into how Black women have been and continue to be robbed of their legacies and impact in history and culture but I just had to put y'all on game about this. Origins of things and even ourselves is so important to know.